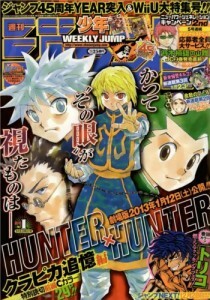 Here’s the official first issue of Weekly Shonen Jump for the upcoming new year. A rare occurrence as we a chapter of Hunter x Hunter; special not regular. Fanboyism is allowed whenever we have chapters like this. Alternatively put; sees Law’s power, jumps up and down with glee. What was great about this chapter was how everything came together. Yes Law’s display of insane strength was at the core of all this, but it wasn’t the only thing that stood out. The new generation is moving forward and it looks like Law’s words to Doflamingo are the declaration of war from the Supernovas. 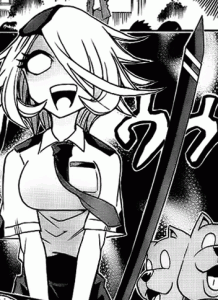 As much as this arc has been up and down, this chapter really pulled it together. Now that we’ve established how strong Luffy and Law are, they’ve declared war against Doflamingo with plans to target a yonko. Already we’re seeing a complex plot developing now, which can be used once again in future chapters. Whether the arc has ended or not remains to be seen. Nothing more comes to mind except for finding out what SAD is and then taking care of the children and the villains for the last time. Definitely an epic chapter because of Law’s appearance and the potential for future plot developments. It’s a little sad that after almost a year we only get a special one-shot from Hunter x Hunter and not the return of the manga. Even so, being grateful as I am, I savoured this chapter for as long as I could. 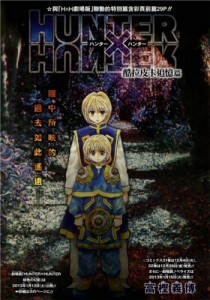 By now it seems almost impossible to bring up Kurapika’s past in the main storyline. We’ve known about the massacre of the Kurta clan from the start and I’ve wondered why we’ve never seen anything about it. Being one of the more interesting plot points, I figured it would get some attention somewhere down the line. 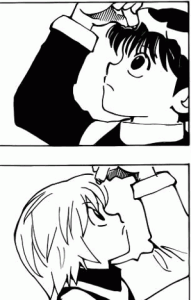 Now with the story at the point where it is, Kurapika hasn’t been present which makes this chapter even more well-timed. It was a nice look into the Kurta clan’s origins and it was definitely an interesting way to go. Making the clan into a secluded community from the village adds some more gravity to the story, because of all the talk about discrimination. Since we know how they met their demise seeing them in everyday life was enjoyable. Kurapika’s drive most definitely comes from the loss of his clan. On the other hand, it makes sense that he was closer to one person than the rest, which also gives him that extra push to hunt down the Phantom Troupe. This chapter was a good start to the origins story that will end next issue. There’s something frustrating about this chapter. As much I loved seeing the Fullbringers back in action, a part of me was more interested in finding out who the mystery person with Urahara is. Understandably, the delay in the identity revelation only adds to anticipation of future chapters. That said, my bet is still on Grimmjow. Whoever it is on the other side of that phone must be important to Ichigo and/or the story. What I like most about this chapter is how the story is being developed in more than one way. On the one hand we have the new King of Soul Society and Squad Zero part of the plot and then we have the bigger picture Quincy vs Shinigami. This upcoming arc could end up being a side story or a component of the main story. Either way, it’s bound to be interesting and I have a hunch that Ichigo may learn about his father and even partake in the Squad Zero activities. If the first three chapters were considered as the fast-paced introduction, then this one would be the immediate breather. Often with a new series starting in Weekly Shonen Jump there are pacing issues. Go to fast and you start creating plot holes amongst other problems. Go to slow and you’re boring the readers, meaning you won’t make it past 20 chapters. This chapter is an acceptable way to slow things down. Because Hungry Joker started off with such speed and strength, we all forgot about the sidekick. Haiji has been the one in the limelight and his assistant was not contributing to the story in any way. She wasn’t dead weight, more like a useless sidekick. Comedy was the prevalent theme of the chapter, in a very enjoyable way. It wasn’t trying to hard and it was created almost effortlessly by Haiji talking. He has a personality that’s a right mix of arrogance and nonchalant. He doesn’t come across as too annoying. Looks like next chapter the story will progress as usual. Quite excited about it. We saw at the end that there was a man waiting, which means we’ll be getting a new antagonist for the upcoming arc. Just as I suspected. the first antagonist could end up being a Millenium Earl like villain: very long-term. 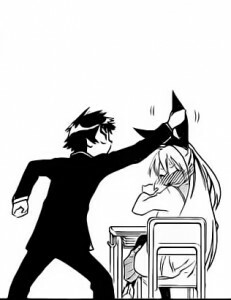 Right now Nisekoi is doing what all romantic comedies do in order to prolong its life. We’re now seeing chapters like this where presumably each girl in the harem will have a little dedication given to her until the verdict is revealed (or should I say confirmed). The chapter was very cute and loveable. It perhaps highlights Onodera’s kawaii factor – lack of confidence – a little too well, but it is enjoyable. Onodera and Raku’s bad timing is the biggest ongoing trope in the entire series. This chapter does well to freshen it up by reversing the usual formula to their interactions whilst maintaining that slight frustration. You know what As cheesy and predictable as this chapter was, I liked it. 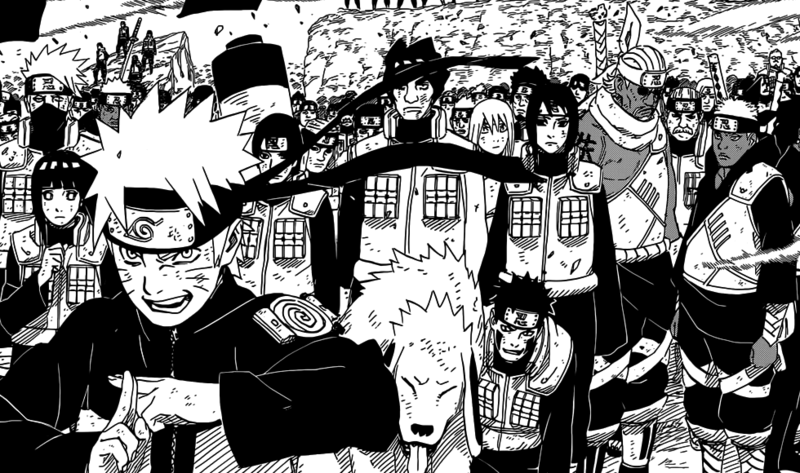 Makes sense that Gai, Kakashi, Bee and Naruto couldn’t take on the Juubi on their own. It’s the Juubi for crying out loud. If they did manage to take it on without any help, we’d have bigger problems. That still doesn’t change how unbelievably cheesy the rest of the chapter was. It was inevitable. Naruto has been saving everyone since the beginning of this series, and now it’s his friends’ turn to return the favour. One of the longest ongoing plot devices used in the series, making it the most obvious choice for a “big development” during the World War arc. Gathering so many people together can only mean that we’re nearing the end. No I’m not forgetting about Sasuke; this is the penultimate battle in some ways. It’s because everyone has gathered that Naruto can focus on saving his fallen friend – lack of bigger picture sense from him – and put an end to the war. Naruto may not have much left in store for us…. Definitely an interesting development in the plot. At least enough to separate this match from any other match we’ve seen. I never actually thought about it, but Seirin haven’t been in leading positions against their big opponents. Unlike the beginning of the series where they dominate most of their opposition until facing the Generation of Miracles and a few others. Credit goes to Fujimaki-sensei for doing some thinking and his homework. Teams that are loosing aren’t the only ones under pressure, in fact it’s teams that are winning who on occasion face more pressure. In Seirin’s case, I can see it being because they aren’t used to leading. It’s hard to foresee how people will react when they win. Athletes can sometimes loose it completely after dominating. My mind always goes to Murray’s return over Gasquet in Wimbledon 2008. Leading also has its own psychological burdens and by no means is easy when you face a tough opponent. 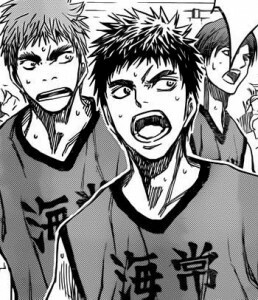 In other news, Kagami continues to grow……Necessary if Seirin’s going to stand a chance against Rakuzan. Don’t forget this was the team that wasn’t even trying and they beat Shuutoku. In the end, this chapter took a turn into a more interesting plot development and broke the KuroBas cycle. Three chapters in and I’m content with this series. This particular chapter was more of the same humour but in a different situation. Not surprising at all given the style of the manga, although I sense a less episodic arc coming up. Whether I keep blogging this series is questionable. It’s funny in its own way, however that doesn’t appeal to me as much. 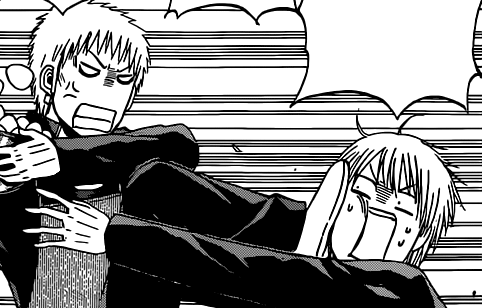 Beelzebub would be my comedy of choice because it’s more obvious and makes me laugh in an out loud manner more than Shinmai Fukei Kiruko-san. A part of me is also pessimistic about this series doing a Reborn! and turning into a battle manga if it fails with the comedy. If the series does venture into a more continuous story with its next arc, I’d like to see what it can do with it. Comedies like this have a hard time breaking away from the episodic and so it can be hit or miss depending on how the two new characters get tied into the story. There’s just something unmoving about this one. Not bad enough to drop but not dazzling enough to anticipate. 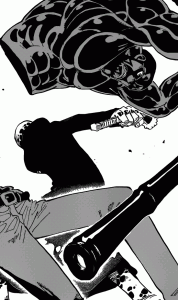 Loved how Furuichi was beaten to a pulp. Didn’t mind that the cooking contest was all a waste of time. Happy in a way that Furuichi and Nene lost. Plenty more opportunities for shipping Kanzaki and Hanazawa. Clearly the most exciting chapter of the bunch. Some bias here because Law is one of my favourite characters ever and in One Piece. Not a bad chapter, but the worst of the issue. For a third chapter it doesn’t have anything that makes me anticipate it. Could become forgettable.